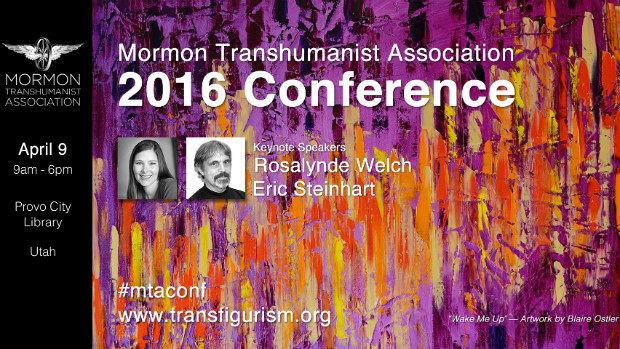 Registration now for the 2016 Conference of the Mormon Transhumanist Association! The 2016 Conference of the Mormon Transhumanist Association will be held on Saturday 9 April 2016 from 9:00am to 9:00pm in Provo, Utah, at the Provo City Library. Speakers will present on the themes of Mormonism, Transhumanism and Transfigurism, with particular attention to topics at the intersection of technology, spirituality, science and religion. The conference is open to the public. Rosalynde Welch holds degrees in English literature from Brigham Young University and the University of California, San Diego, where her dissertation focused on private conscience in early modern English literature. She writes on interreligious issues for the St Louis Post-Dispatch, and she blogs on Mormon issues at timesandseasons.org. She also serves as the managing editor of the Mormon Review, and she steals the occasional afternoon to pursue her own research agendas in early modern literature and Mormon literature and philosophy. Rosalynde and her husband, together with their four young children, make their home in St Louis, Missouri. Eric Steinhart is the author of Your Digital Afterlives: Computational Theories of Life After Death and Professor of Philosophy at William Paterson University. He works primarily on metaphysics using contemporary analytical and logical methods and tools. He is also interested in historical metaphysical systems (particularly Plotinus, Neoplatonism, and Leibniz). Steinhart grew up on a farm. He was originally trained as a computer scientist and mathematician, and worked as a software designer for several years. Some of his algorithms have been patented. He holds advanced degrees in philosophy. His past work has concerned Nietzsche as well as metaphor (analyzed using possible worlds semantics). He has written extensively on the metaphysics and computation. He is featured in the film Chronotrip, a documentary about time travel. He is increasingly interested in the philosophy of religion, focusing on the intersection of the formal sciences and theology. He is especially interested in alternatives to Abrahamic religion. He affirms the existence of transfinitely endless hierarchies of sets, computers, languages, games, strategies, and minds. He believes in the existence of more things than you do. He also likes New York City, New England, mountain hiking, all sorts of biking, chess, microscopy, and photography. The deadline for paper submissions is 1 February 2016. Please submit your papers soon! More details can be found on our call for papers.